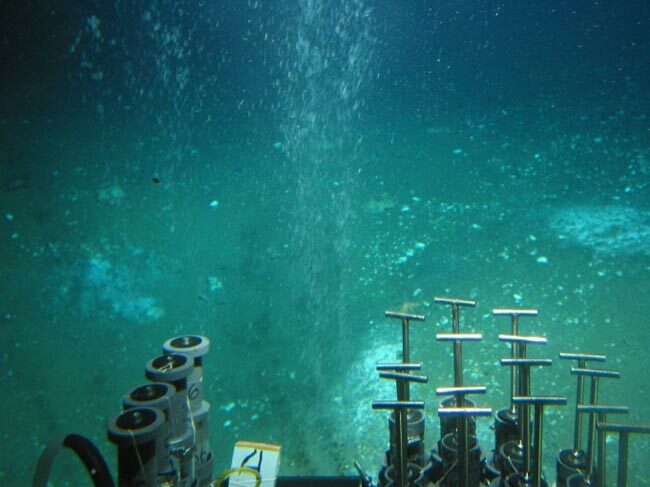 Cold Seeps occur mostly along continental margins, where gases (CH4 or methane - sometimes as methane-hydrate ice--and hydrogen sulfide) and oil seep out of the sediments and also provide abundant energy for eubacteria, and archaea, which are the basis of a "gas-powered" foodchain. 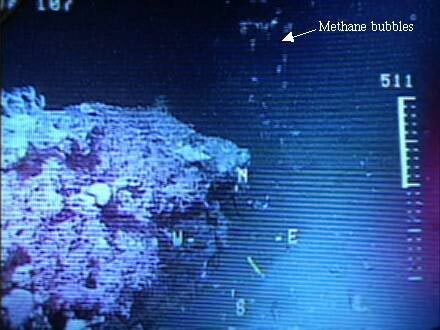 Methane (or natural gas, identical to that used by humans) freezes in cold and high pressure, melting above about 600m depth. 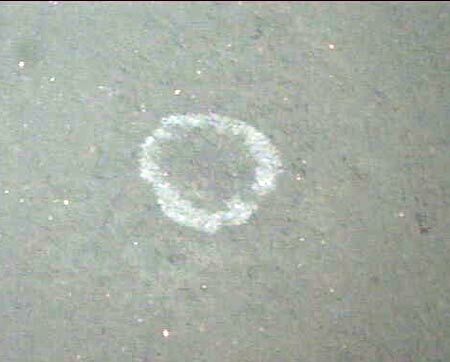 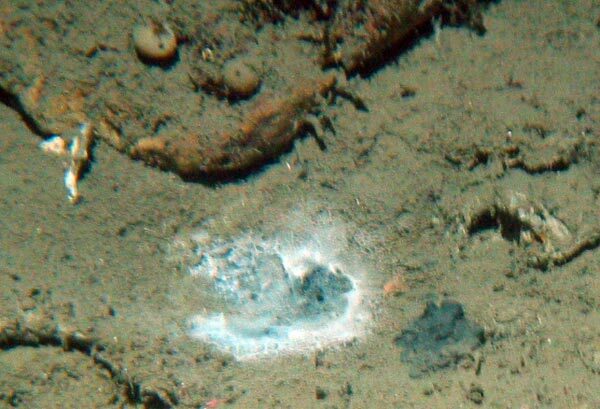 There, cold methane seeps out of the bottom in streaming bubbles, sometimes called a cold vent instead of a seep (see movie below). 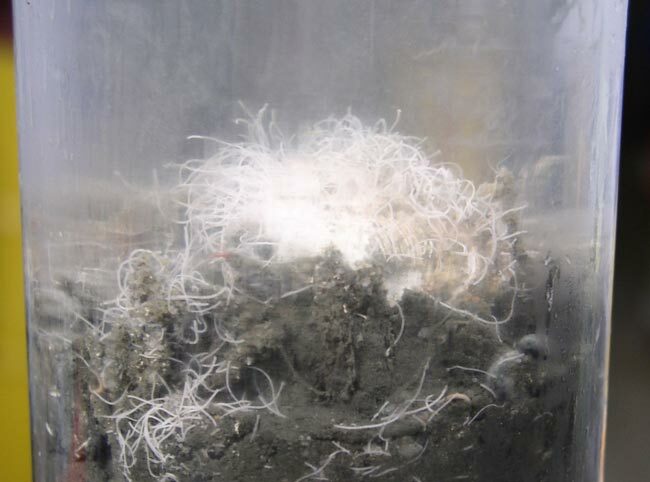 Microbial reactions with methane produce H2S (rotten-egg-smelling hydrogen sulfide), and ii) carbonate rock formations (see below under Eel River Seeps for details).Clams, mussels and vestimentiferan tubeworms are dominant animals, and they rely on symbiotic bacteria in their feeding tissues (gills in clams and mussels, trophosome in tubeworms). 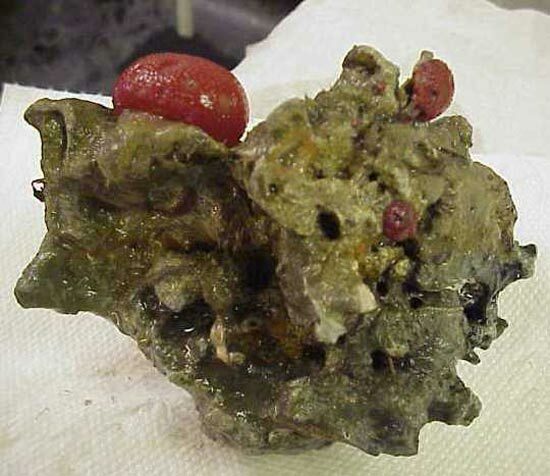 These bacteria use H2S or methane for energy. 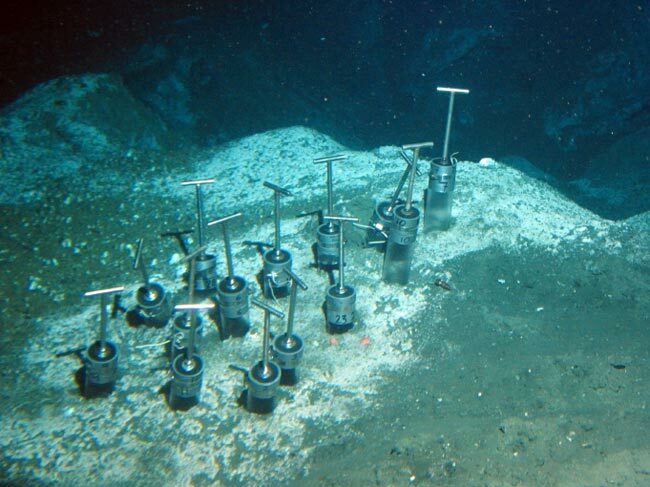 Our studies are on adaptation of seep and vent animals to high pressure and toxic sulfide. 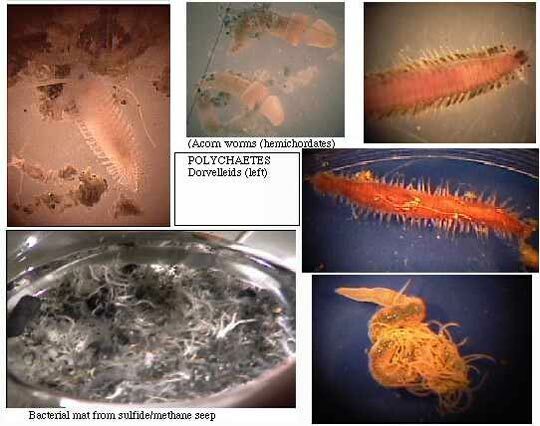 We have used specimens provided by Drs. 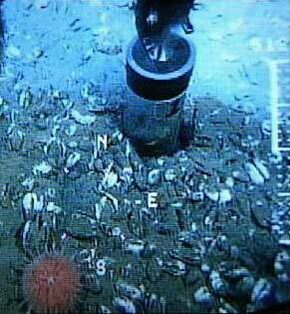 C. Fisher (Penn State), R. Lee (WSU), L. Levin (Scripps Inst. 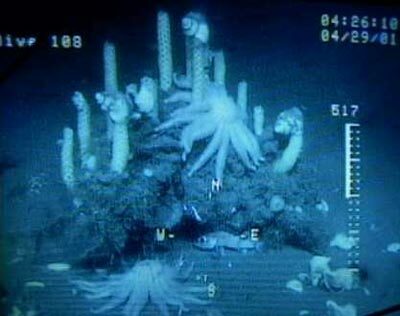 Oceanography); 1995-96 specimens trawled up by me and Dr. Joe Siebenaller of L.S.U. 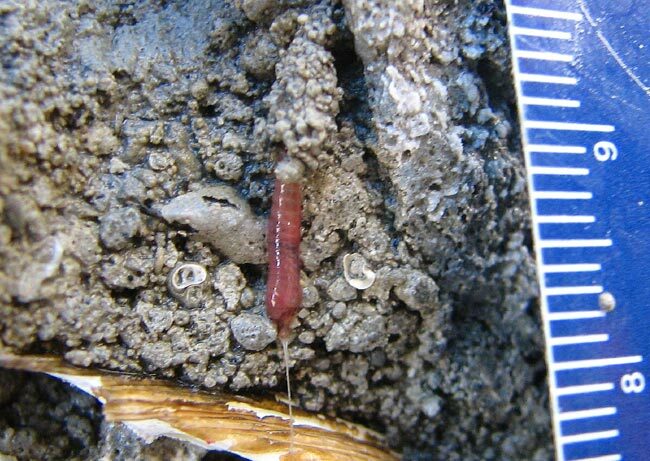 ; and 2006 specimens collected by me and colleagues on the Eel River seeps off California and Hydrate Ridge Seeps off Oregon in Alvin studies lead by Dr. Lisa Levin of Scripps Inst. 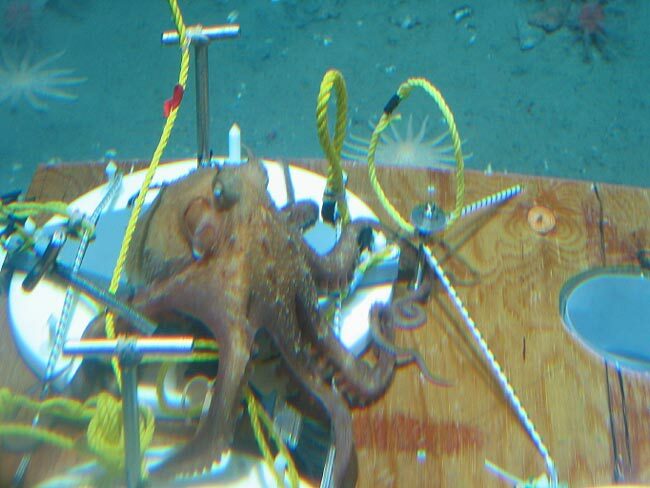 Oceanography and Dr. Ray Lee of Washington State University. 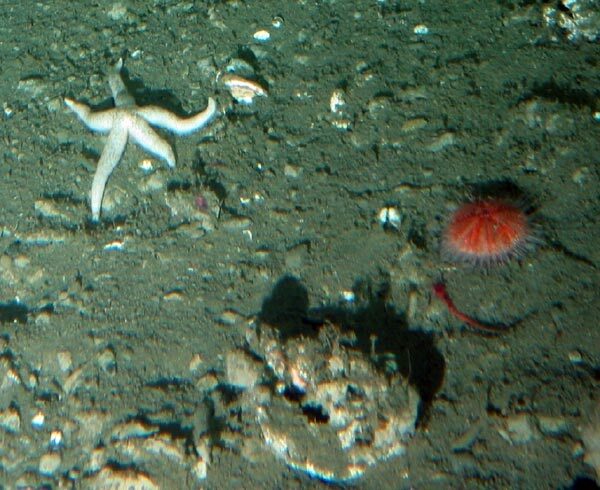 a. Eel River Seeps on the slope off Eureka, Calif., 510-520m, photographed and sampled by us using a remote-operated vehicle or ROV (2001), and with the ALVIN (2006) (studies led by Dr. Lisa Levin, Scripps Inst. 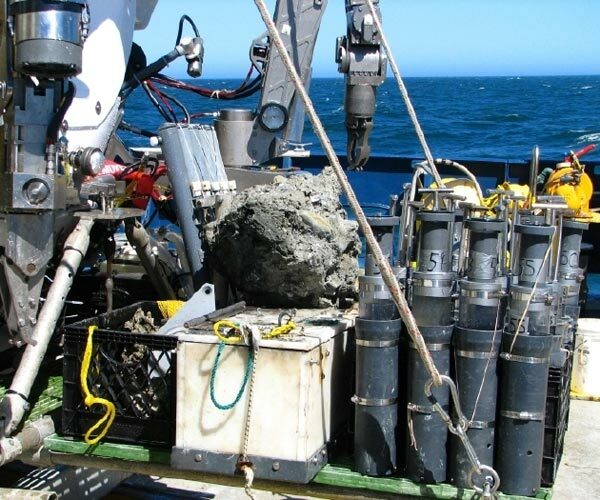 Oceanography). 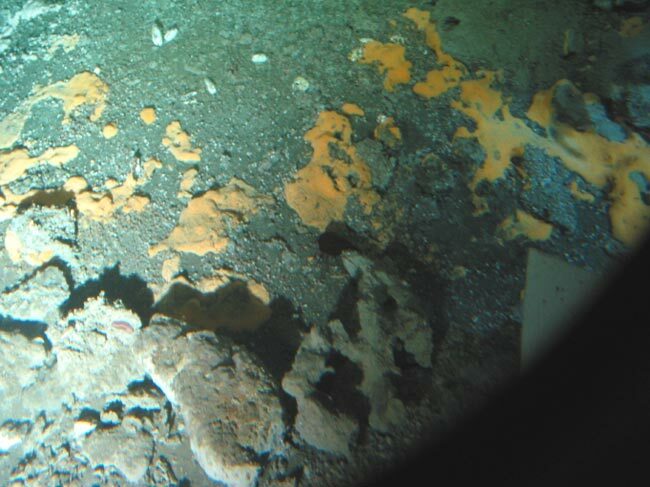 b. Hydrate Ridge Seeps off Newport, Oregon, 599-890m, photographed and sampled on the ALVIN (2006), (studies led by Drs. 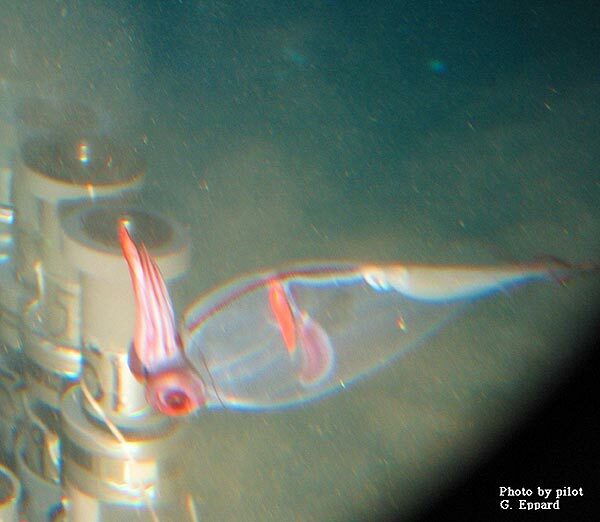 Lisa Levin and Raymond Lee, Washington State Univ.). 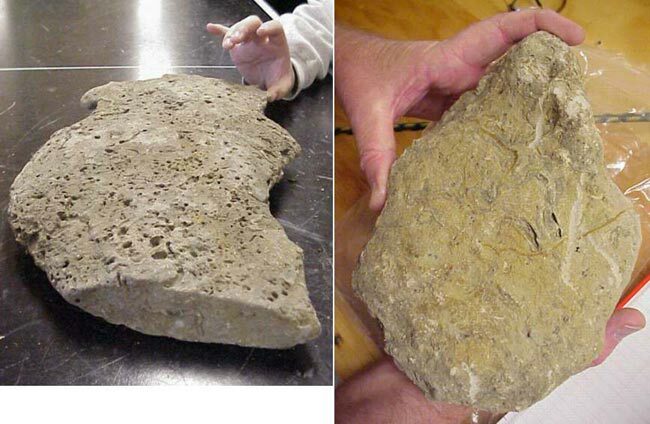 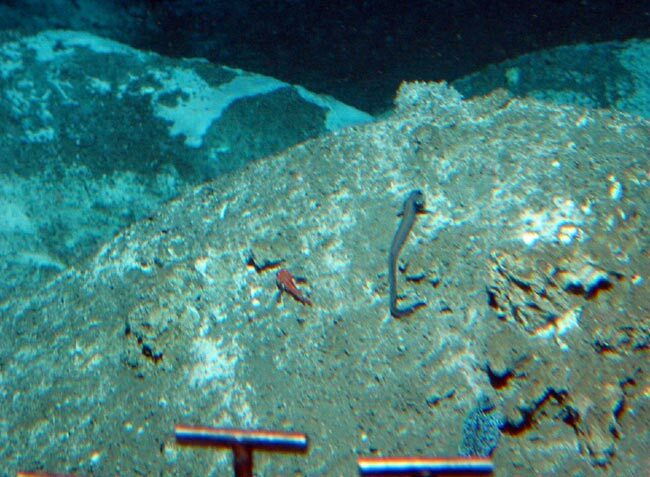 a. Oregon Slope Seeps, 1800-2000 m, caught by deep-sea otter trawl (1995-96); with Dr. Joe Siebenaller of L.S.U. 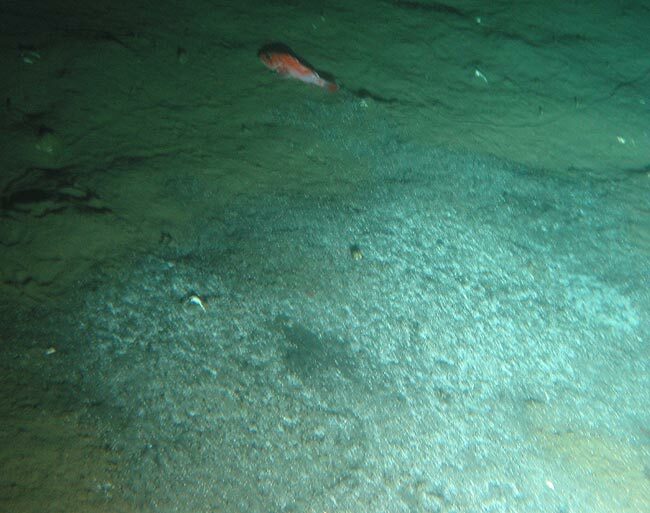 b. Aleutian and Japan Trench Seeps, 4400-6400m; animals provided by Drs. Levin (Scripps) and C. Kato (JAMSTEC), respectively. 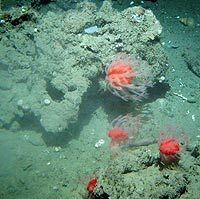 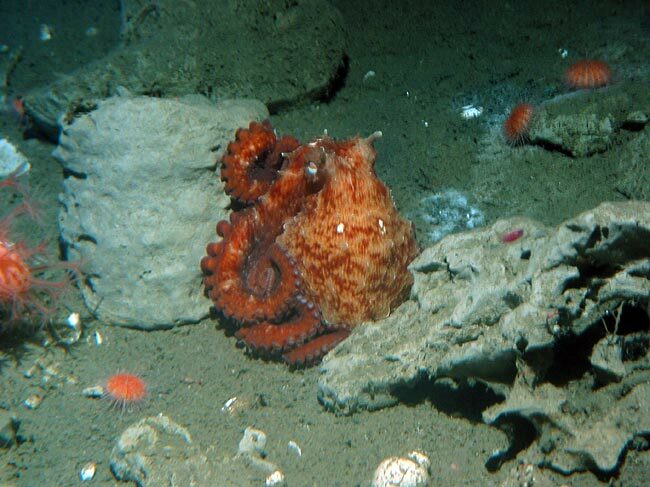 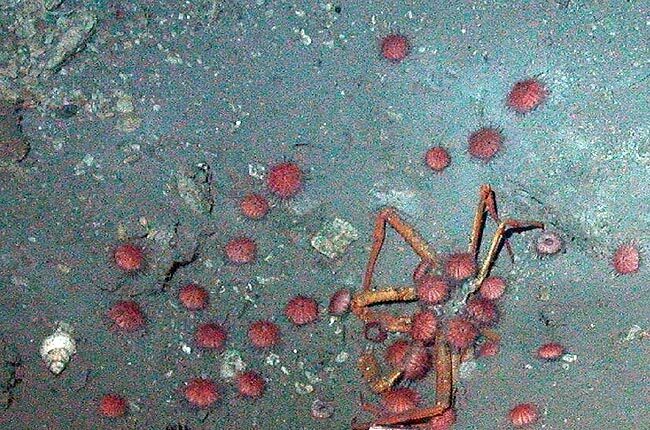 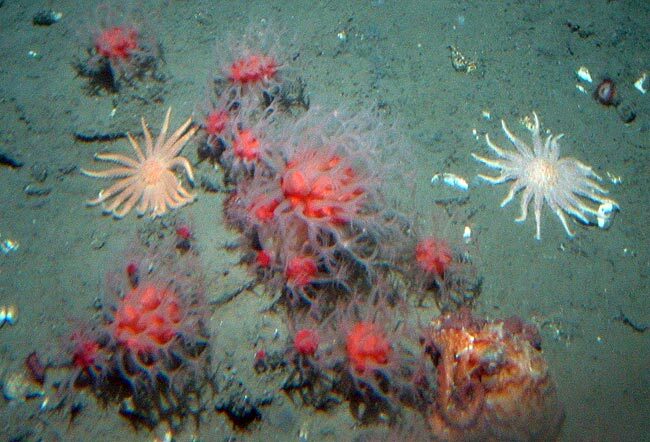 More on Seeps: See pictures below; and Monterey Bay Aquarium Research Institute's Cold-Seep site for more pictures and information. 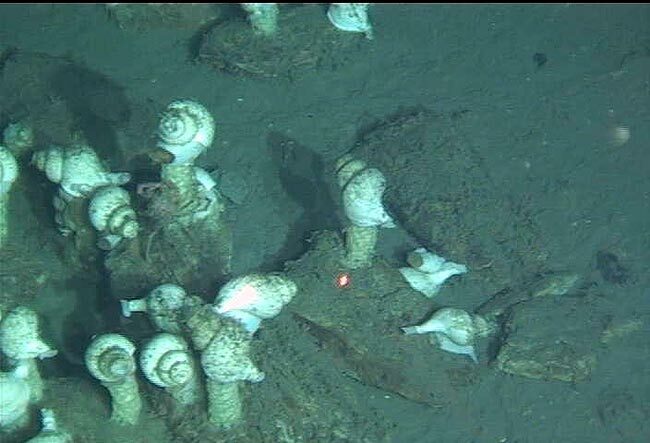 "Babysitter" snails on towers of spiral eggcases on a carbonate (microbially-precipitated) rock. 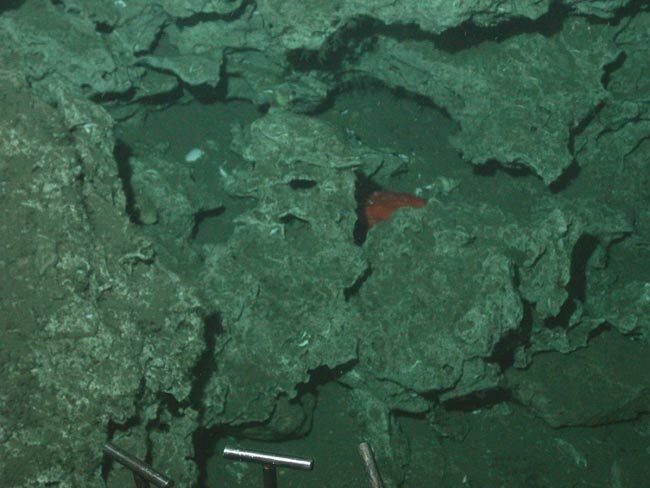 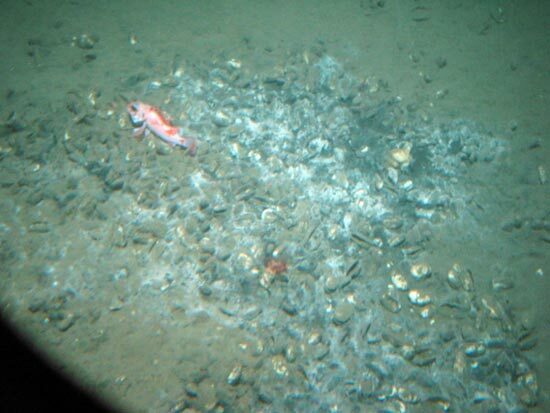 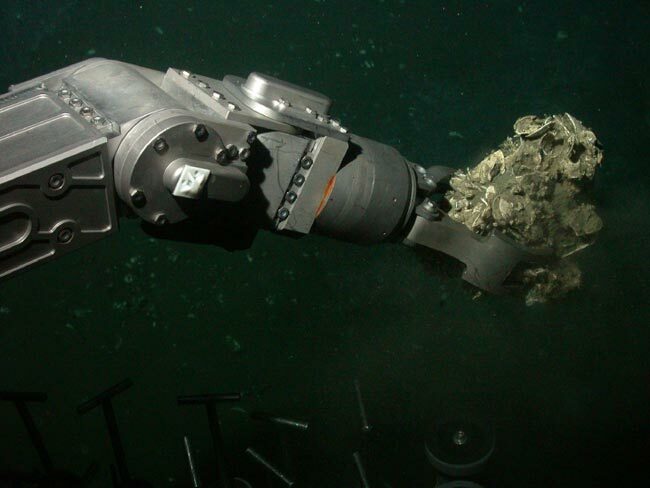 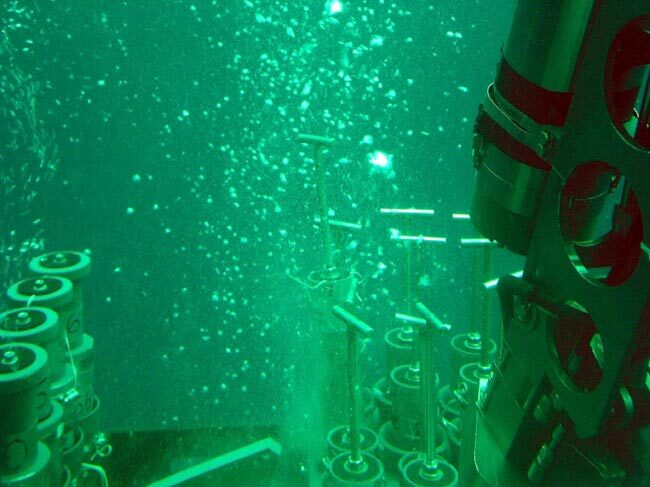 a) Eel River Seeps: 20+ miles off Eureka, Calif.
At 500-600m, methane hydrates do not stay frozen, and the gas often bubbles (vents) out of the sediments, accompanied by hydrogen sulfide produced by microbes. 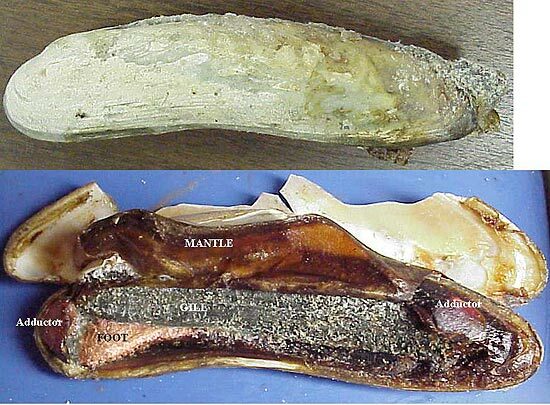 Both are utilized by bacteria (methanotrophic archaea, sulfide-oxidizing archaea and eubacteria) for energy. 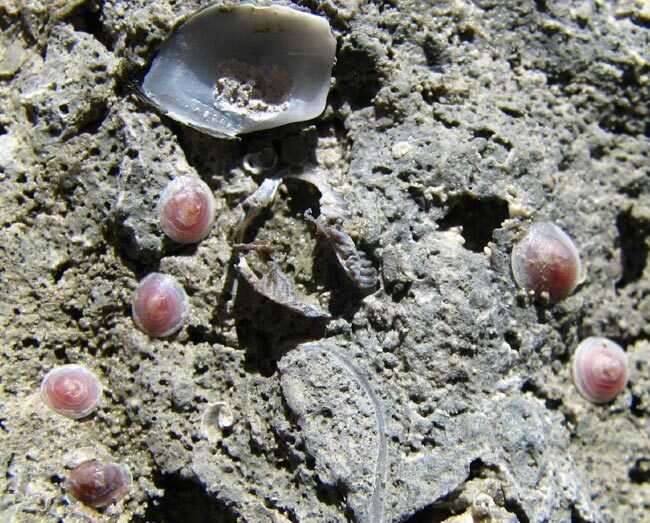 Clams have some of these bacteria as symbionts, which provide them with sugars in return for a safe place to live and for energy-rich gases that the clam takes up for them. 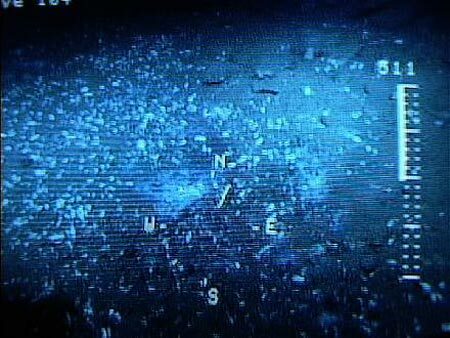 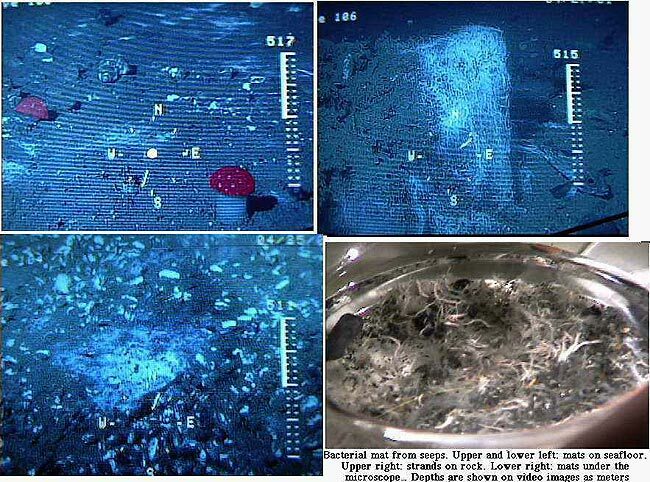 The blue low-resolution images are from an ROV camera monitor; the other underwater scenes are from the ALVIN cameras. 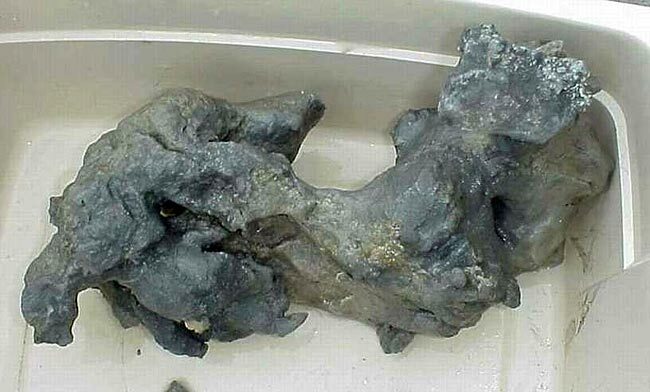 Pictures taken by me in air are samples brought back to the ship. Dr. Lisa Levin's site has more information and pictures of the Eel River study site. 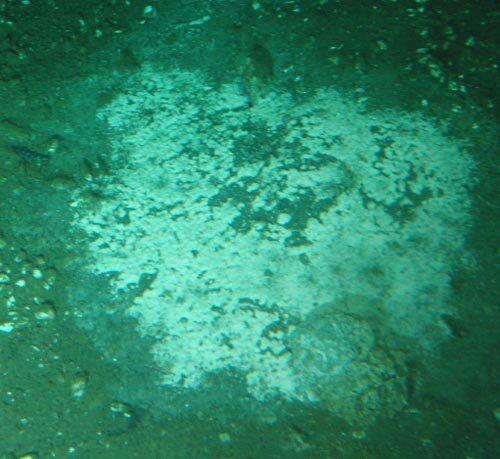 These are methane and sulfide seeps at various locations in the Pacific. 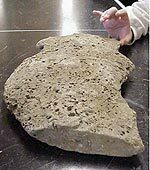 The Oregon ones are on the continental shelf. 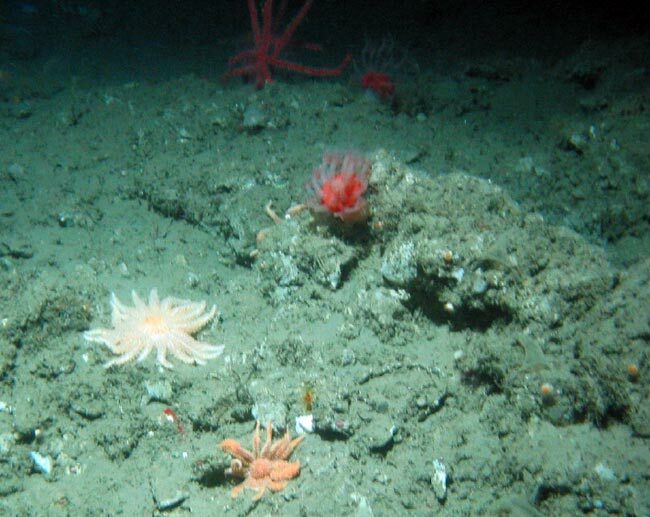 The Alaska ones are in the Aleutian Trench. 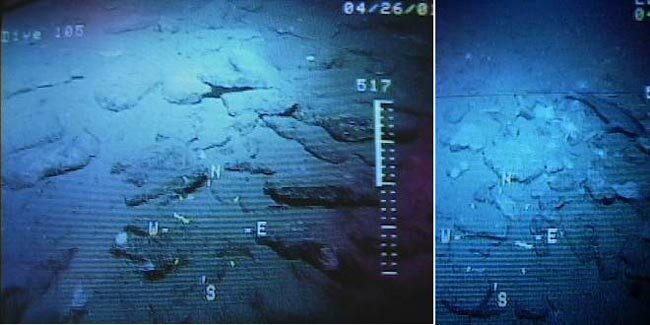 The Japan ones are in Sagami Bay and Okinawa Trough (about 1100m) and the Japan Trench. 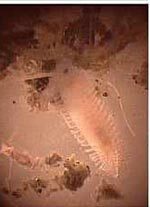 From Oregon, Lamellibrachia barhami, a gutless vestimentiferan tubeworm with bacterial symbionts in its trophosome (an organ that replaces the gut). 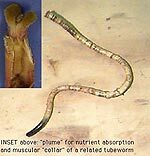 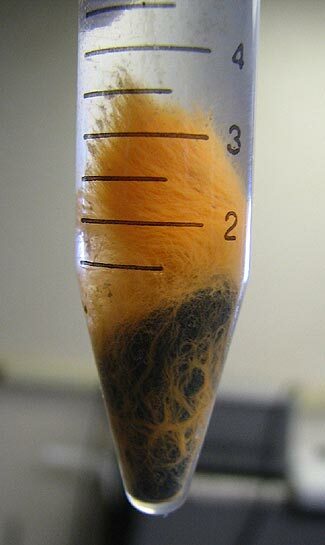 These symbionts use energy-rich gases to make useful organic compounds, excesses of which feed the worm host. 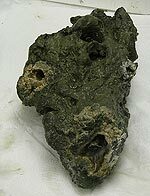 We have discovered them to have high concentrations of methyltaurine, a highly unusual sulfur-based osmolyte (Yin et al., 2000). Right picture is the plume of a related escarpid worm; the plume absorbs molecules that the symbionts need. 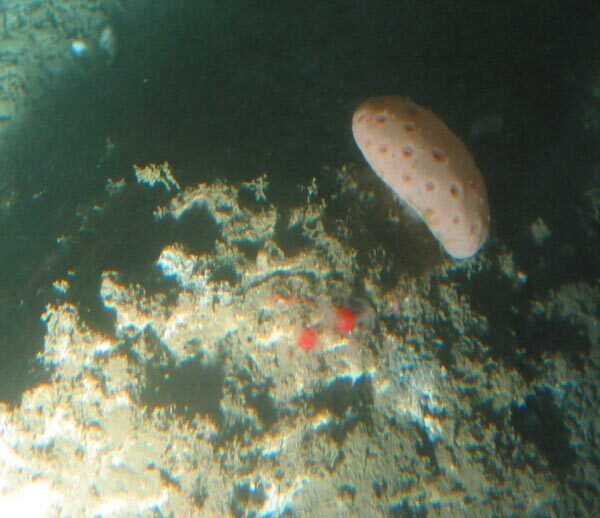 Right: Calyptogena spp. 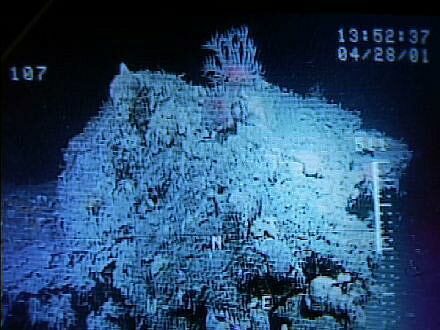 from ALASKA at 4400 (specimens provided by Dr. Lisa Levin, Scripps) and JAPAN TRENCH at 6400m (Hadal zone) (specimens provided by JAMSTEC). 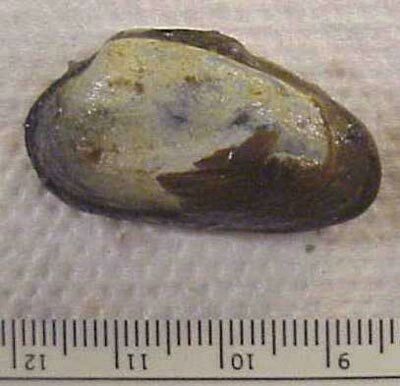 Both clams have extremely elongated forms compared to other vesicomyid clams. 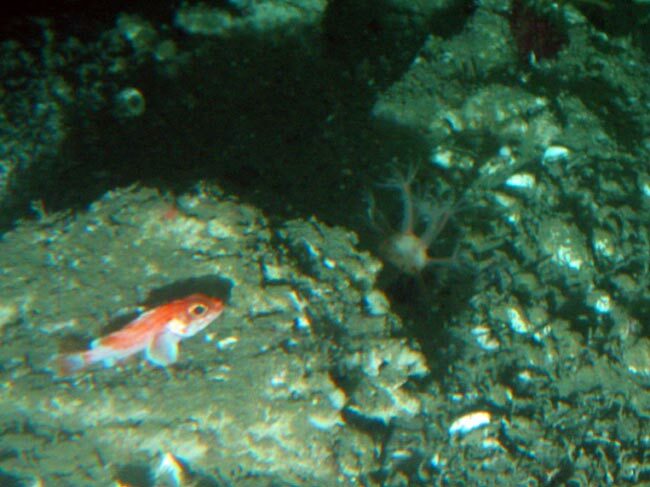 To see the Alaska and Oregon clams in their habitats, see Dr. Lisa Levin's website. 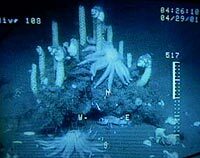 To see the Japan Trench clams in their habitat, click here for JAMSTEC's site--click on Photo Gallery then look for Cold Seep photo. 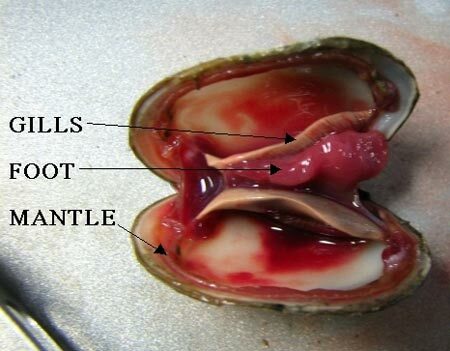 These large clams have bacterial symbionts in their gills. 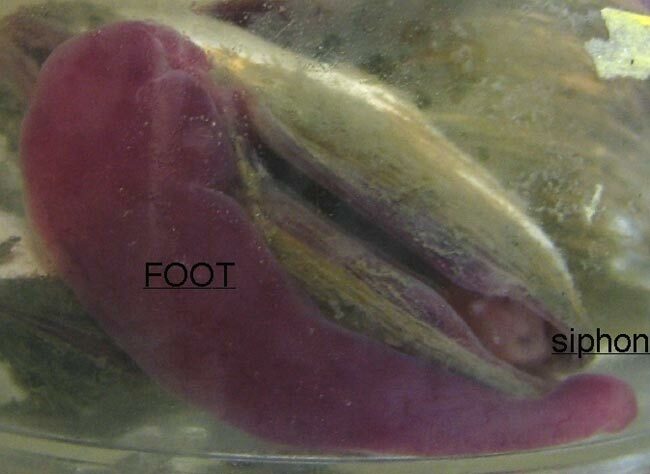 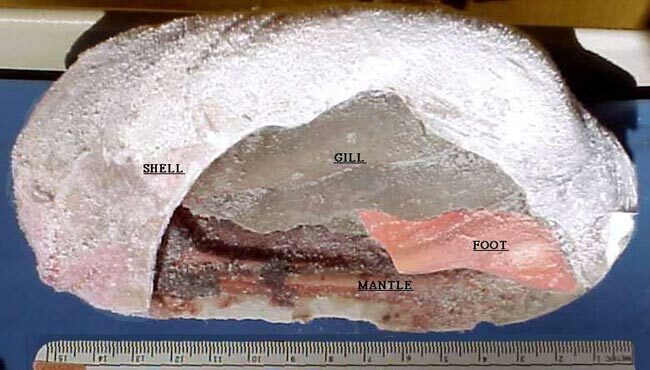 The dissection photos show the gills, and the foot that this clam extends to gather sulfide (or methane?) for its symbionts. 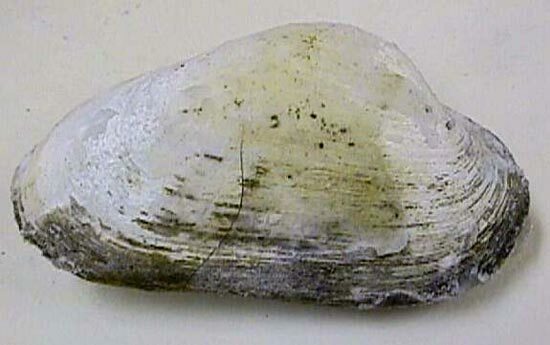 These symbionts use energy-rich gases to make useful organic compounds, excesses of which feed the clam host.